Couldn’t find that newer article, but I did read the older one about the Davenrich winery... cool. I recently acquired a press from a family member, and ordered some Marechal Foch hybrid vines to fill my half-acre back yard (the wife isn’t too happy about it). 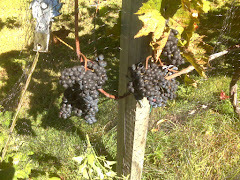 I live by the WI/IL state line, and it looked like a good grape for the climate as far as I could tell. Any advise on where to find info on winemaking with this grape? I need a sort of starting point. I read your article in Winemaker. 27 degrees here this morning. 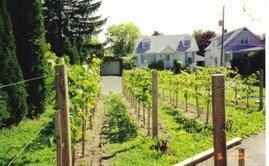 (Waverly NY, west of BGM) I have 2 dozen grape vines, Noiret and Traminette, which I covered last night and the night before. A couple of the older ones look a little icky yesterday morning. We'll see. Thanks for the blog. I hope you made out alright with your vines. If frost gets them they'll look like someone burned the ends of them. They'll continue to grow and depending on the amount of damage and the variety you may still get a decent crop. I had to run my sprinklers on Monday night too. 30F here, but thankfully no damage. I am in Pittsburgh pa Zone 6, I am interested in the regent grape Vs. Cabernet Franc. So, i guess my questions are how is growing the regent grape? You planted in 2006 right? How do you think it would handle oaking? As for cabernet franc, i am intimidated by possibly being up to my ears in disease control, i am doing my home work but and cautions or pointers in growing the cab franc? Interesting article. My family own a vinyard. This is useful info.